Many people have found working from home to be not only more convenient but more efficient and better for family life. If you plan to have an office in your new log home, here are seven tips to help you design in the features you need to make a home office successful. Lighting— Make sure you design in plenty of good, direct lighting. Indirect lighting may be aesthetically appealing but if you’re planning on accomplishing a lot, you’ll need good lighting to keep your attention level high. Use table lamps, overhead fixtures and floor lamps in combination to achieve a good mix. Natural light is also important to keep your energy up, but you may want to avoid the prettiest view, as it could become a distraction. Wiring— Offices are now computerized, electronic marvels and they all need plenty of power outlets to hook into. Make sure you have plenty of electrical outlets, and enough telephone and cable inlets. Position them on the wall you plan to place your desk against, and make sure they are easily accessible without having to move furniture. Raising convenience outlets to above table height can help to organize the tangle of wires often found under the desk. If you haven’t considered it, now’s the time to look into installing your in-hone wireless router for whole house wi-fi access. Furniture— There are plenty of choices for home office furniture from re-purposing antique tables and desks to opting for a complete new suite. Make sure you have enough space for organizing and filing any paperwork and work materials. 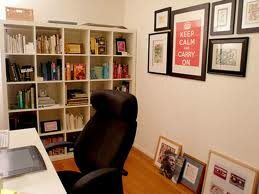 If you refer to magazines or other periodicals, books or manuals, you’ll want to position ample, adjustable shelving nearby your main work area to accommodate different sizing and formats. KraftMaid is one company that designs beautiful, functional office furniture. They have designed ingenious units to tuck away daily functions: a slide-out wastebasket cabinet, adjustable desk drawer dividers, and other unique storage options. The goal is to make your office your own space. Your Chair —You’ll spend more than a few hours a day sitting in your chair, so why not make it a comfortable one? You can opt for high-end in the Herman Miller Aeron chair, or go for simplicity with a rubber exercise ball sized to fit your frame. Either way, make sure your chair provides you with support and comfort and is ergonomically fit to you. Colors— Many office designers recommend vibrant interesting color schemes rather than soothing ones to keep you energized for the at-home workday. Colorful posters or artwork that are relevant to your profession can enliven your office and make guests or clients feel welcome. Keep walls light in color and provide visually interesting splashes of color to keep your mind engaged. Dual-Purposing Your Office — If you are planning to use your office to host the occasional overnight guest, make sure you can easily stow your work product to keep files confidential and out of the way. If a fold-out couch or futon is part of the guest-room part of the equation, make sure that when the bed folded out, your guest has plenty of room to maneuver without accidentally knocking into your office computer or file work. You’ll want to shut down your computers, printers, answering machine and other equipment to keep ambient noise to a minimum overnight. Create a Quiet Zone — If your work involves a lot of heavy thinking or telephone calls to clients, you’ll want to make sure you can close the door and maintain a professional atmosphere when necessary. It may take some gentle diplomacy if working from home is a new situation, but laying ground rules early can head-off future distractions. Designing the perfect work zone in your home can lead to a productive and enjoyable career.